These are about the size of most dogs, so for them, this could be a new play buddy. 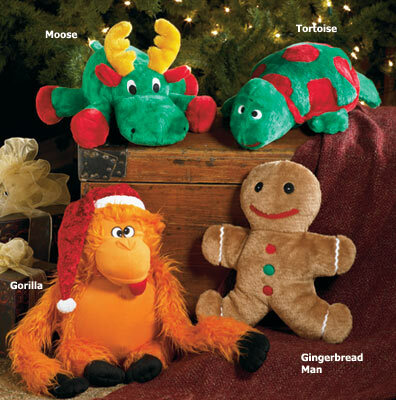 For larger dogs though these Plush Gingerbread Men are just right to wrestle with and play. What a great way to have more Gingerbread Men roaming the house. They would have slipped past us since the main listing on the site was for a big bear. But this image was lower on the site so we checked out the ordering pull down and our new Gingerbread Man buddy was there. Even if you don’t have a dog, these could be fun to have standing next to a corner table. They have enough detail to be nice Gingerbread Men without having all the glitter that your four legged family member shouldn’t be chewing on. Did we mention this ‘toy’ is 15 inches tall? !